One of the most frequent questions people with renal failure ask after beginning dialysis is, "How long can I live on dialysis?" The answer to this question differs greatly among specific individuals who have renal failure. High blood pressure, diabetes, proteinuria and hematuria are all high risks to worsen individuals’ medical condition, so controlling them timely and effectively is very necessary to live longer. A healthy diet and correct medications are also helpful to control these complications. Research shows vitamin C has a big benefit of improving patients’ kidney function and lowering high creatinine level. Fruits such as kiwi and cranberry, and vegetables all can help people slow the progression of their condition. 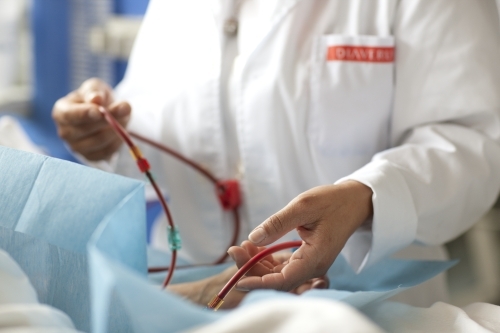 With correct treatment and a healthy lifestyle, patients with renal failure don’t need to be bothered by the question, “How long can people with renal failure live on dialysis?” If they continue to educate themselves with updated, usable information which they can apply in their daily lives, these patients can live long and fulfilling lives. For more strategies for kidney health visit, Kidney Coach.